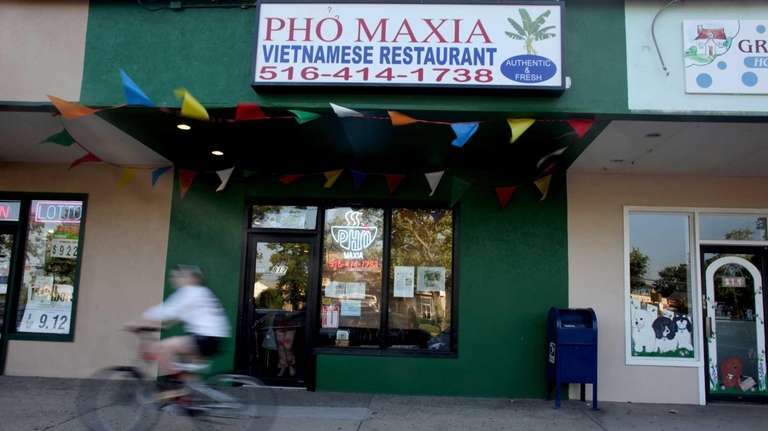 Located in Westbury, Pho Maxia is a bare-bones storefront that packs a punch with its food. Though being a small spot, there's still table service for this cash-only restaurant, but the payoff is in its low prices and bold flavors. This Vietnamese restaurant sticks to traditional food and clean, fresh preparation. Long Island's diminutive Vietnamese restaurant scene is all the grander for the opening of Pho Maxia. The bare-bones storefront is a modern reincarnation of the Bethpage restaurant Maxia, which had a short stint during the late '90s under co-owning brothers Hoa Kevin Du and David Yu. The two are back, with chef Yu in fine culinary form. There's table service here, but for the time being, no alcohol and a cash-only policy. The payoff: low prices and bold, clean flavors. The namesake dish, pho, or rice noodle soup, comes in several variations. The pho special features an aromatic broth with thin noodles, tender sliced beef filet, beef shank and characteristically spongy Vietnamese beef balls, which you may request omitted. On the side: bean sprouts, basil and lemon add to taste. A fairly ordinary shrimp summer roll -- shrimp, vermicelli, cilantro and mint leaves bundled in cool rice paper -- doesn't approach the level of the crisp, delicate hot fried spring rolls, which you wrap in lettuce leaves, along with fresh mint, then dip in fish sauce -- a winning juxtaposition of flavors, textures and temperatures. Skewered grilled beef and chicken satays turn out tender and juicy beyond expectation. Then, there's the traditional banh mi sandwich on French bread. The fine "Maxia special" version -- made with sliced pork roll, pork sausage and pâté, plus lettuce, pickled carrot, cilantro and cucumber -- is surpassed by the banh mi nem nuong, made with grilled hash pork. Think of it as a Vietnamese take on a burger. You'll want to try the dish called banh hoi, which features angel hair pasta woven into little patties, steamed and presented with lettuce leaves, fresh mint and pickled vegetables. 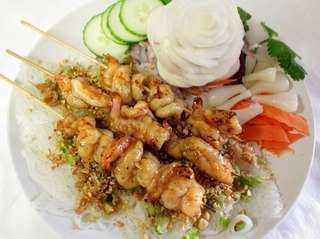 Banh hoi tom nuong features lemongrass-grilled shrimp. You place some shellfish on the angel hair, pile on the toppings and wrap everything up in a lettuce leaf. So worth the effort. Another specialty category known as "bun'' features rice vermicelli with bean sprouts, cucumber and mint in a cool, refreshing sauce topped with warm grilled beef, chicken, shrimp, pork or spring rolls. You'll find major satisfaction in the tender grilled pork chop on rice, a study in flavor and nuance. Conclude with the creamy French flan with caramel sauce. Or a glass of young coconut juice. It's a real eye-opener. So, too, the flavors at Pho Maxia.